When hunting wildflowers, obviously you have to keep your eyes open, and sometimes it helps to keep your nose open. But sometimes it pays to keep your ears open, too. “No, where?” says the other woman. “Right over there, behind my car,” says the first. Well. I wasn’t going to lose my place in line, but as soon as I finished that task I joined the small crowd gathered around this plant, the only specimen I saw on the trip. Just like with the past few plants I’ve posted about, I had a bit of trouble nailing down which species this is. 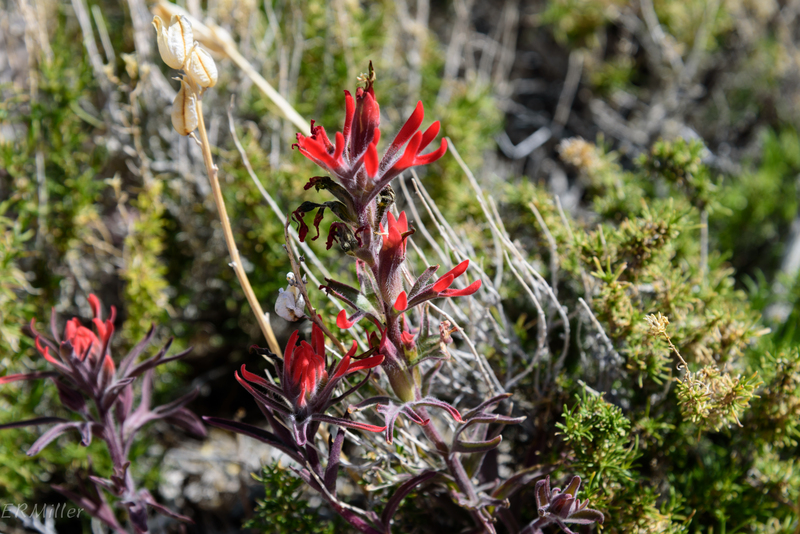 I finally decided on Castilleja applegatei ssp. martinii (one of four subspecies) because that’s the one in the pamphlet I purchased at the Furnace Creek Visitor Center; the description reads “May grow through shrubs for support; in mid to high elevations.” As you can see this was growing through a shrub, and that parking lot is a little under 5000′ above sea level. However… I can never leave good enough alone. Calflora doesn’t show that species growing anywhere near Dante’s View. A little more research, and I came up with another ID: C. chromosa. Which is a name no longer accepted by ITIS, which calls it C. angustifolia var. dubia. Which is plausible. I don’t have the details to say which species it is. I dunno. Maybe I should just call it “paintbrush” and be done. 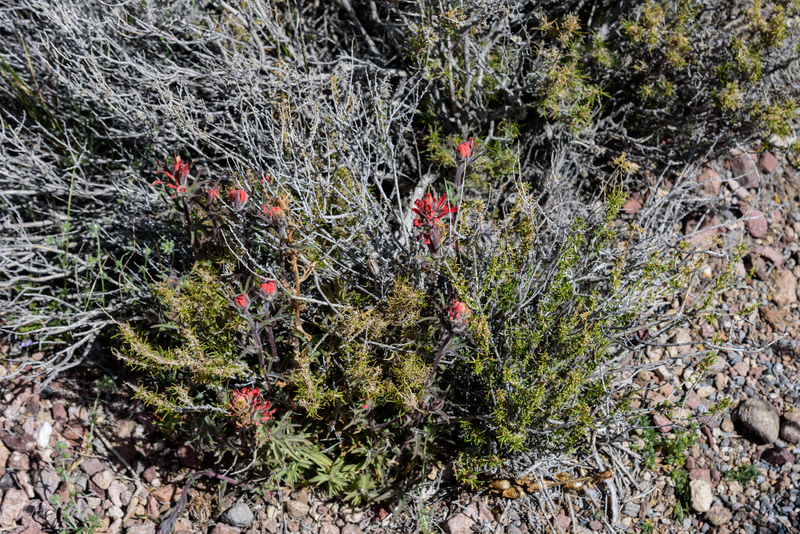 This entry was posted in Uncategorized and tagged Castilleja, Death Valley, desert paintbrush, Indian paintbrush, Martin's painbrush, Orobanchaceae, paintbrush by elizabeth. Bookmark the permalink. No matter the name, it’s beautiful.